The 2019 Research and Creativity Expo is coming up on May 1-10. To get our community excited about the student presentations that will be featured at the Expo, we’re speaking to several student presenters, finding out more about their research, and learning about their hopes for the future. At John Jay, research is a key element of our mission to educate for justice, because evidence-based data and thoughtful analysis opens minds and helps communities build a more just society. 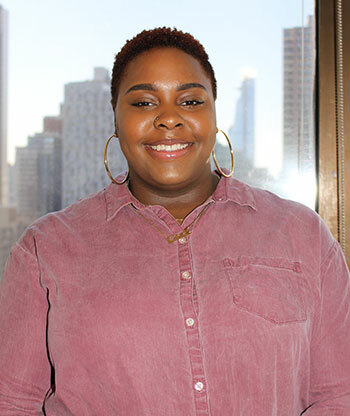 Our first student presenter is Ayanna Miller-Smith ’19, a McNair Scholar and Forensic Psychology major from Brooklyn, New York, who will be presenting her research on the portrayal of police brutality on social media and its effects on populations. Can you tell me a little bit about your project? My project takes a look at the psychological and sociological impact of vicariously experiencing police brutality on social media. It was inspired by a tweet that I made that said 'Sometimes I struggle between wanting to share instances of police brutality and protecting my own mental health and the mental health of my followers.' I posted this when the Philando Castile video came out, because it was very traumatic for me. Social media is a great way to share information, but showing videos like this can be traumatizing because it’s so graphic. When I came across the Castile video, I didn’t even click on it. It started playing automatically on my timeline and I didn’t have the choice to engage in this content. Talking to my peers I realized that we all felt anxious because it was too much to take in. How do you think social media platforms play a role in how people view police interactions with communities? The thing about social media, and my research paper called Citizen Journalism and #Activism, is that there’s no filter. Angela Davis talks a lot about image activism and how when there are murals of great leaders in elementary schools, that’s a form of image activism, because the children are seeing people who look like them in these great places. When you think about the counter of image activism, that’s what you’re seeing on social media with these police brutality videos. You’re seeing mostly black and brown people of all ages being murdered or injured by the police. You’re seeing someone who looks like you or people you care about, in this unfortunate event. That type of image activism is hurtful. And, that’s what I wanted to look at in my research, because I knew that I couldn’t be the only person who felt this way when I saw these things on social media. My goal was 100 participants and just getting that and having people give me their time for free was hard. The research design was another challenge. I spent almost two years designing and honing out the details of this project because I wanted my research to be something meaningful and important. It took me about a year to get to my current research question—my first question was about cyberbullying and then it was about if social media desensitizes people, but I couldn’t get into the nuances of it to make it a good project—and then I spent the next year figuring out the best design. I went through hundreds of scales. I emailed professors at other universities asking for access to their content. And then, I found this one scale called The Impact of Events Scale (IES), which assesses the impact traumatic life events, has on an individual. I previously found the Race-Based Traumatic Stress Symptom Scale (RBTSSS) which is based on chronic racism and stresses throughout one’s lifetime. But, it was important for me to show that while someone may be experiencing race-based stress as a person of color in this country, they are particularly being impacted by police brutality videos being on social media. I had to get the question that narrow, and the RBTSSS wasn’t narrow enough. What was the most rewarding moment of your research? I went to the Black Doctoral Network Conference and a component of this conference is the Undergraduate Research Poster Competition. I went up against at least 100 undergrads, and most of their research was complete. I had the wrong poster slides, my research wasn’t finished, and I felt a little embarrassed. But, I ended up getting an honorable mention and that was an important moment for me. And, then I took a class called “Racial Justice and Policing” with Dr. Phillip Atiba Goff. In that class we had different scholars come in and talk about their work. One scholar didn’t have the exact same research question as me, but they utilized the same scale and methods that I did. For me, that was a confirmation that I was on the right track, because someone with a Ph.D. had the same thinking about how to conduct this research. Was there a professor who helped you with your research? My McNair mentor was Dr. Zelma Henriques from the Law, Police Studies, and Criminal Justice Administration Department. She let me do my own thing and made sure that I was on the right track. She helped me refine my ideas. Dr. Henriques was an amazing mentor, and I couldn’t have done this without her. What have you learned about yourself while doing this project? I didn’t know anything about research, academia, or Ph.D.s until I was introduced to McNair. I remember my first time having to do a literature review, I thought it was terrible. But now that I know how to do it, I do them daily at the Center for Policing Equity (CPE). I’m teaching other people how to do them efficiently and how to get the most value out of it. The project also taught me discipline. I finished McNair with just a proposal and I didn't have to do anything else after that. But, I put so much work into this research that I wanted to see it carried out. I also realized that I love to share information. When I presented my proposal at the McNair conference last year, President Mason was genuinely interested and asked to see my results when I finish, that was a reaffirming moment for me. As a college focused on justice issues, how does your research help move the needle forward on justice issues? My larger argument is that when real trauma is present in a community, it’s going to affect the way community members interact with law enforcement. And, so when we try to talk about community policing and moving forward in a positive light, you have to recognize that some of these people are experiencing PTSD from what is going on in society. Although it may not be the fault of the police department, it changes the way community members interact with law enforcement. For me, it’s about moving forward and recognizing when there may be trauma present and using that to change the way police interact with these communities. You can’t have community policing if there’s no trust. You can’t have trust if there’s trauma. It’s time to fix this, and create safer and more united communities. In five years I see myself completing a Ph.D. program in Criminology and Justice Policy from Northeastern University, where I will be attending in the fall. And maybe I’ll become a professor because I believe in mentorship and I want to continue the pipeline of students of color into graduate school. My main goal is to conduct research and influence policy within the criminal justice context in a positive way. When I went to Northeastern and interviewed, it automatically felt like a right fit. I’m very much into participatory action research, where you participate in the community that you are researching, and Northeastern is the best place for that. What has the Research and Creativity Expo experience done for you? It’s reaffirmed to me that my ideas are important, my voice is important, and that I have a space in academia, in research, John Jay, and at Northeastern. I would have never thought that I would be doing research and going to a Ph.D. program. That wasn’t something I thought about and I’m sure teachers who had me in elementary and middle school, would be surprised. I wasn’t the best student. I got good grades, but my behavior wasn’t the best. As a black girl in the school system of New York City, I was criminalized and a lot of opportunities were taken from me, not because I wasn’t good enough, but because of my perceived behavior. Being able to turn that narrative around is important to me. This experience has taught me that I’m not the story that people put on me. Without John Jay, I would not have had these opportunities prepare me for my future career. I transferred here from Howard University and I tell people all the time that I got what I needed from Howard, identity and culture wise. By the time I got to John Jay, it was time to get to business and figure out what I wanted to do. This is when I did all my internships, all my research, and when I figured everything out. Without John Jay, I don't think I would have learned that I loved research and been able to apply it to the niche that I wanted to apply it to, which is policing, psychology, corrections and reentry. To learn more about this presentation and others, make sure to come to the Research and Creativity Expo from May 1-10.